Photo by Daan Verhoeven, courtesy of Vertical Blue 2015. By Rustom Bharucha, Convenor of PSi#21 Fluid States, New Delhi. I write to you from land-locked, dusty, sultry New Delhi with no water in sight. The monsoon is two months away and likely to play truant. In this arid state, it would be foolish to imagine myself playing the role of the cloud-messenger as in Kalidasa’s immortal poem Meghaduta. Instead, I am more of a conduit who has been entrusted by the organizers of Fluid States to send you a ‘vessel’, which I would prefer to think of as a gift. A gift of words. And yet, I wonder if this gift will make sense and not just be received as a ritual obligation. 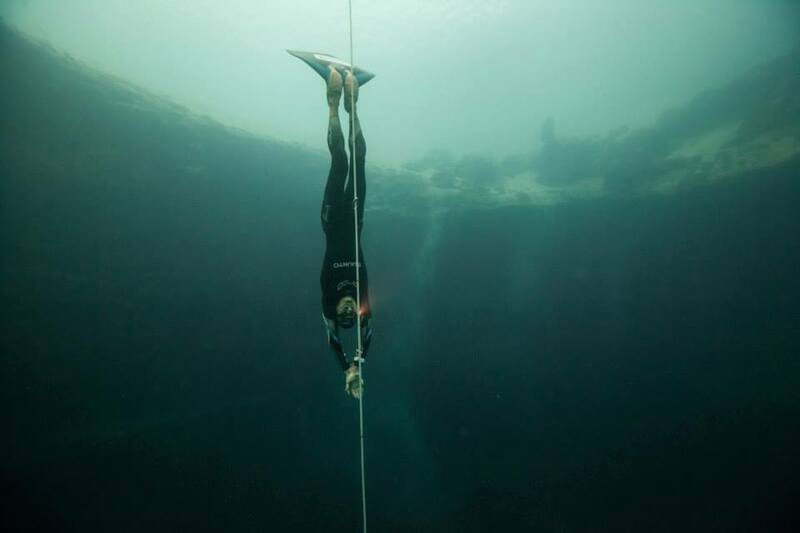 What, after all, could be the possible connection between the Vertical Blue free-diving championship and the conference on ‘Rethinking Labor and the Creative Economy,’ which I had curated as part of Fluid States at the Jawaharlal Nehru University in New Delhi in late February? In this conference, which dealt with a spectrum of labor practices – brutal, cruel, caste-bound, and virtual – ranging from the material labor of broom-making and scavenging to invisible forms of ‘immaterial labor’ in the creative industries, I had questioned the valorization of ‘fluidity’ in the global economy. Along with so-called global ‘flows’ of information and capital, I felt that we needed to highlight the disjunctions, ruptures and blockages that are monitored by the dominant global forces of our times. Inevitably, this was a political reading of ‘flow’. What makes your cluster so viscerally different is that it is, as your vision statement expresses so eloquently, a ‘genuinely water-bound examination of performance.’ Far from responding to fluidity at a purely conceptual or metaphorical level, it ‘places its research within the water, within a liquid space.’ I find this at once thrilling and deeply moving. My cue for the creative impulse underlying this message is drawn from your invitation to ‘look beneath the surface of things, and dive into places beyond the reach of breath.’ Breath could be our tenuous link. For you the sudden, precipitous depth of Dean’s Blue Hole provides the testing-ground for the ultimate risk-act of free-diving which involves breath. Breath that pushes the possibilities of human endurance to the very limits of existence, reminding us of the prescience of Antonin Artaud’s fundamental premise that ‘there can be theatre only from the moment when the impossible really begins.’ It would seem to me that free-diving is that sport which is also an art where the impossible is the precondition of its existence. The impossible can be read as extremity, danger, a leap into the abyss, but it can also be read as life bordering on death that can only be lived in the moment. On reading William Trubridge, who attempts to find words for the actual psychophysical, phenomenological, moment-by-moment experience of what it means to ‘swim up’ from a depth of 100 meters – the ascent being more potentially perilous than the descent into the depths of the sea where the body surrenders to ‘negative buoyancy’ – one encounters in all its terrifying vulnerability ‘the present moment, with no record of the past or concept of the future.’ Just the moment barely held together with the shreds of human consciousness that is barely able to sustain a count. In searching for a more creative way of expressing my thoughts in relation to a different kind of ‘holistic challenge’, I would like to share with you the ancient Indian musical tradition of Dhrupad, which has its roots in Vedic chanting and mantras. Here we find a different kind of ‘diving’ into the depths of pure sound, in that primal region of pre-vocal registers and notes which cannot be heard. The outcome of years of training, and intimate knowledge of the microtonalities of the voice, in which there could be as many as 5040 permutations of seven notes, Dhrupad is often regarded as ‘the yoga of sound – nada yoga.’ The musician Ashish Sankrityayan informs us that while sound can be ‘anchored to the vocal chords’, it can also ‘fill the body like a fluid entity, and can flow with the prana or vital breath.’ Such is the sound of Dhrupad, which flows infinitesimally in the depths of the inner body from the navel into the heart, throat, palate, lips, tongue, teeth, the head, through the energy channels of the chakras. It is a fluid state of pure notes through whose resonance the singer becomes one with the inner self. Let me play for you now a short, 5-minute passage from the opening alaap of Raag Yaman, as sung by Uday Bhawalkar, a disciple of the Dagar brothers. I realize that 5 minutes of an extremely slow modulation of notes may seem as excruciating as the time taken for a free-diver to surface from the depths of the sea. But I request your attention and openness to this ‘diving in’ and ‘diving up’ of sound. These words move me deeply because they alert me to the knowledge that in every attempt to achieve the superhuman and to defy the worldly constraints of fear and the mechanisms of terror in our times, it is humility that makes such acts possible: a surrender of the self to what lies beyond the reach of breath.